In a recent survey, 66% of respondents said their coworkers candidly discussed politics in the workplace. These discussions can easily turn into arguments, or worse. 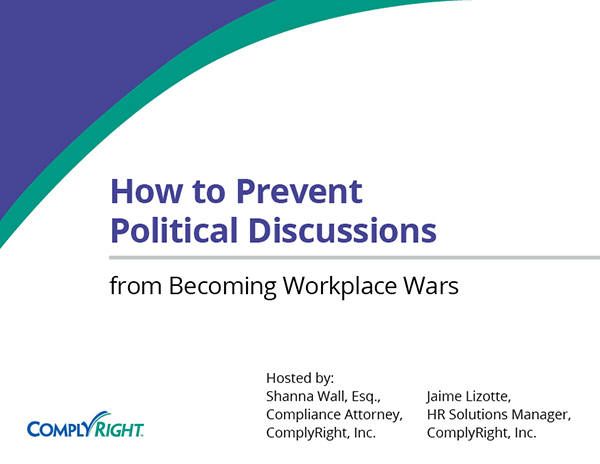 Now is the time to understand the legal boundaries of political expression at work and set the stage for a peaceful and productive work environment throughout the campaign season. We are a small office, and our owner is very involved in politics. She wants to close the office the morning of the elections, and require all employees to vote, and if they don’t show proof they voted, their pay will get docked for the morning. Can she do that? It’s not legal for employers to require all their employees to vote; they can encourage them to vote, and that’s a great thing for them to do, but as far as requiring them all to vote, that’s not something private employers want to push upon their employees. As it’s OK to encourage their employees, they can’t make it a condition in order to receive pay. Choosing whether or not to vote has to be the employee’s decision, and employers cannot require that. The employer could certainly close the office, and encourage their employees to vote without endorsing a particular party, or candidate, but all the employees should be treated the same way in terms of pay. If they decide to close the office from 9-11 on a Tuesday morning when the polls are open, regardless if that employee comes back with proof that he or she voted or not, if they set that condition, all the employees that day should be paid the same if they didn’t vote because it can’t be a requirement on their part. We do allow employees time off to vote, but if they take more than two hours, can we dock their pay? It depends. First you need to check with your state law to see if you’re required to pay your employees for time off. Second, this can also become a wage and hour issue, so let’s assume you’re not required to pay your employees for time off. Even if you are not required to pay them when they leave to go vote, what you can and can’t do depends on if they’re exempt or non-exempt employees. For non-exempt employees you can pay them hourly for their actual working time, so if they aren’t at work you don’t have to pay them. However, for salary-exempt employees you can’t generally dock their pay for partial days worked, so if they leave for a couple of hours you can’t dock their pay, but you can dock time off from their PTO bank. You can deduct time, but you can’t deduct pay. The first place to start is to check your state laws to see if you are required to pay them or not. Can you expand upon the following states: Michigan, Connecticut, Indiana, and Washington, and what is required and whether they need to pay, or if they have to require time off for voting? There are approximately 30 states that do have some state law requirements, specifically MI, CN, IN, WA, are actually four that do not have any state-specific requirements. In that scenario, that’s left up to the company to decide what they want to do. It’s always best practice to allow time if there’s not sufficient time for employees to work, but in those four specific states there’s no law that requires you give them time off or that you pay. There are approximately 30 states that do: AL, AK, AZ, AR, CA, CO, GA, HI, IL, IO, KS, KY, MD, MA, MN, MO, NB, NV, NM, NY, ND, OH, OK, SD, TN, TX, UT, WV, WI, WY. I’m not going into the specifics of each of those, but understand that most of them do require at least two hours for the polls to be open either before or after the shift. Most of these states do require that the employee be paid, so you want to check your state and local laws, and check that out before you send any policies regarding that. We have a large Hispanic population at my office, and break room talk often turns to Trump and immigration; it’s making some employees uncomfortable, so how would you handle? My recommendation would be to have a manager and employee diversity training. 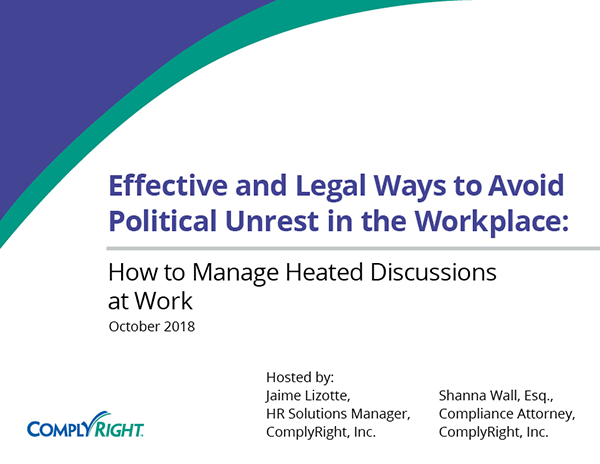 This is a good time for you to give a refresher course to both your managers and your employees, and as part of the meeting you want to discuss your political activities policy, and if you don’t have one it’s a great time to implement one. Then you can actually review the do’s and don’ts that we mentioned in the webinar. You also want to encourage your managers to lead by example. Remind your employees that, if there’s a conversation that’s making them uncomfortable, it’s best to step away, or change the subject; and, if it gets to a point where they’re extremely uncomfortable, make sure they know they can go to HR, because if it becomes a disciplinary problem you want your managers to handle it immediately, so it doesn’t get blown out of proportion. That would be the best way to handle that sort of situation so your employees are aware of what can and cannot be talked about when it comes to politics in the workplace and everybody has an understanding and it’s comfortable in your company. My employee is posting pro-Republican messages in his cubicle; can I legally ask him to remove it? Yes, you can. Private employers can have a workplace policy that forbids displaying any political messaging for or against a candidate, party, or position. The key is you have to be consistent. You can’t allow certain employees to display messages, but not others, so stay consistent, but it’s your policy to determine how you want to handle that. Get the latest news and free resources from ComplyRight delivered straight to your inbox. 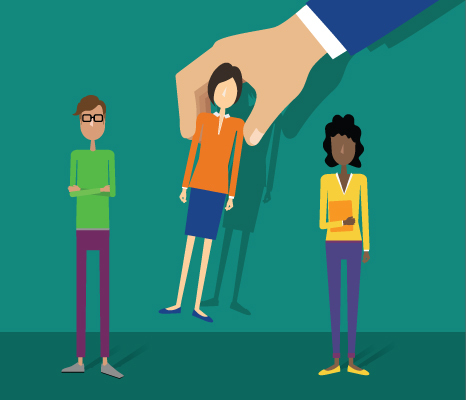 You've just unlocked a wealth of FREE resources to build HR confidence. ComplyRight provides free educational resources related to employee management, labor law and compliance. Better understand HR basics and learn how to address specific issues by browsing our knowledge center. Thank you. We already have your email address on file. At ComplyRight, our mission is to free employers from the burden of tracking and complying with the complex web of federal, state and local employment laws, so they can stay focused on managing and growing their businesses.